Romance: I thought I had it pretty much figured out, but alas, like almost everyone else I have no clue. The title ‘Modern Romance’ intrigued me and listening to the audio clip on Audible, I expected another memoir by a comedian, like Amy Poehlers ‘Yes Please’, or Tina Feys ‘Bossypants’. Modern Romance is not that, but what is it? 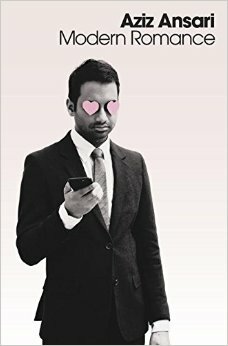 Modern Romance is the result of a two year research project, set up by Aziz Ansari and sociologist Eric Klinenberg into romance in the 21st century. The book is split into different topics that vary from the use of apps (like tinder or snapchat) to texting or finding out how dating was 50 years ago. Aziz uses examples taken from Reddit fora and peoples phones (they gave him permission during live shows or focus groups) to explain phenomena occurring in the current dating scene. He also traveled to Paris, Buenos Aires, Qatar and Tokyo to see the dating cultures there and the difference with the ‘American’ way. I listened to the audiobook, but the physical book has a lot of graphs and such to help with the visualization of all this data. I really enjoyed listening to this audiobook. I thought Aziz told his story hilariously, especially when pointing out differences between the audio book and the physical book. The concept was also very interesting. Although some of the information mentioned in this book is pretty obvious, there is also some stuff that really makes you think. For example, they went to an elderly home to interview people on how they met their husbands/wives and most of them had married someone who lived very nearby. Most women married to be able to move away from their parents or out of a pension for women. In the Western world, this is no longer very common, but in Qatar, the women said the same thing about their reason for marrying. If you enjoy reading (or listening to) non-fiction, then yes. This book was hilarious at times and made me laugh out loud. It was more interesting then a memoir, since there were even some life lessons to be learned, but it was still funny. I do think I would recommend getting the physical book, just because some of the aspects of the book, like text message conversations, just work better on paper then in audio.